Roger Corman, one of the stars of "The Silence of the Lambs," signed on to do this movie because he was blown away by the script. He stated that he loved the idea of the monster of this horror movie was not a creature, the monster was a man. That is why this movie left a scar on me after I viewed it. When I watch something with Freddy Krueger or Chucky, it is a lot easier to buy into the disbelief, because I believe they are creatures made up from fiction and they can't hurt me. Serial killers on the other hand, are very real. They have been real for awhile. So a movie that really gets into the minds of this type of person was resounding to me. I also find it most impressive that "The Silence of the Lambs" is the only horror movie to sweep the Oscars, and I wonder how long it will hold onto that title. Even if you have never seen a Hannibal Lecture movie, you know who he is. You know that Anthony Hopkins played him. You may even know him from the NBC series that is currently getting ready for its third season. He is a pretty iconic character because he's a serial killing cannibal who helps FBI agents catch other serial killers from his jail cell. He is also features a boatload of charisma that only Hopkins could create. If you know Hannibal, you probably know Clarice, the FBI agent who spends a couple movies obsessed with the cannibal. 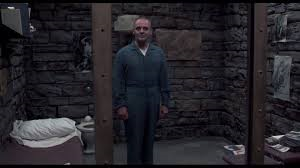 In "The Silence of the Lambs," Hannibal helps Clarice track down Buffalo Bill, a serial killer who skins his victims in order to make a female skin suit. Now, Hopkins is as good as you could imagine if you haven't seen this movie. Everything he does in this movie is ultra-freaky. But, at the same time, there is a humanizing demeanor to everything he does in this movie. He is a bad guy you can't help but root for, and not in a gimmicky way as some movies try to do. Hopkins has never been this good before, and he relished every moment on screen. With that said, I have a hard time trying to decipher who is more creepy, Hannibal or Buffalo Bill. Buffalo Bill is brought to life by Ted Levine. You may know him from USA's "Monk" television show. He was also in movies like "Heat," "Shutter Island" and "The Hills Have Eyes" remake. But he rose to prominence with his portrayal of Buffalo Bill. Levine was born to bring this character to life. He's got that iconic voice that just sounds off, sounding like it would belong to a character like this. And I mean no disrespect toward Levine, he used his voice talent to perfection and created an equally creepy mannerism that work all movie long. There are a couple of key scenes that elevate this movie from good to great. The first is the first encounter Clarice has with Hannibal. The interplay between Hopkins and Jodi Foster is some of the very best acting of the 1990's. You felt for Clarice as she slowly makes her way down the corridor toward Hannibal's cell, and he standing there, smiling, waiting for her. There are very few scenes with two actors that displayed so much power and this is a highlight of that style of scene. Then, in the middle of the movie, there is the scene when Hannibal escapes captivity, in the most primal of ways. The way he displays the murdered guards is so crude to the point of being nightmarish. And the big reveal of how Hannibal gets away is a scene that takes my breath away each time. Then, there is the blackout scene. When Clarice finally has Buffalo Bill cornered and he turns off the electricity and turns on his night vision goggles. The hair rises on my arms every time, and my heart races. Absolutely resounding scenes. There is a very good reason why "The Silence of the Lambs" was so successful during its awards season. If you haven't discovered why yet, you better soon.